This decadent Chocolate Raspberry Baked Oatmeal is a perfect way to treat a crowd to a sweet weekend brunch. If you haven’t heard, brunch and I? We’re a serious thing. Like we’re talking promise rings, shared milkshakes, taking-me-to-the-sock-hop kinda serious. It doesn’t matter whether we’re having a sweet or savoury moment, I’m all in. 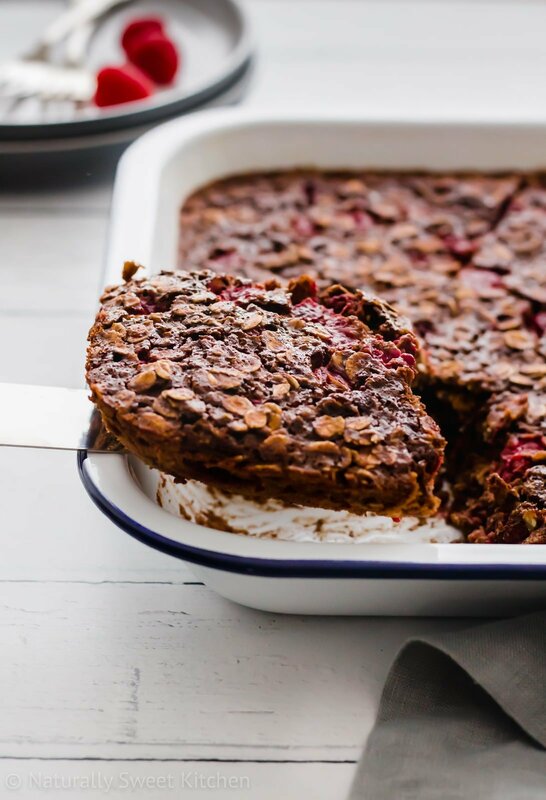 And this Chocolate Raspberry Baked Oatmeal is edging its way to the top of my favourite sweet brunches list. I mean can you imagine a more perfect combination? Chocolate and raspberries were just made for one another. I’m going to get real on you for a moment. I eat oatmeal five days a week. 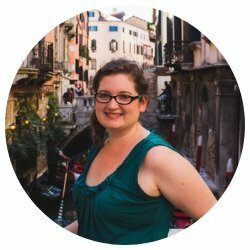 Not just because I’m obsessed with it (I eat hot oatmeal in winter and overnight oats when it warms up – there’s no stopping this love fest), but also to keep everything flowing right. When I don’t eat oats regularly, let’s just say some other things aren’t too regular either. If you’re like me and have the same trouble (along with the other 2m UK adults), you probably got fed up with the same old brown sugar topping ages ago. Say no more. 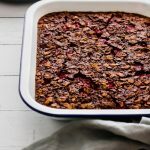 Over the years, I’ve become the queen of mixing up different flavour combos for my oatmeal, and I have to say that this Chocolate Raspberry Baked Oatmeal is probably one of the best I’ve concocted. Not to toot my own horn or anything. I mean, you could add another step to include tossing on some whipped cream or yogurt and your favourite fruit, but really that’s optional. Another great thing about having baked oatmeal for brunch is that it’s incredibly filling; it’s packed with fibre from the oats and a punch of protein from the eggs. 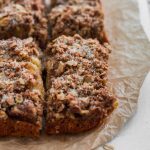 One slice of this will keep you fueled for all your morning activities – whether that’s running the kids to soccer practice, storming the farmer’s market for meal prep, or nursing a hangover. Not only is baked oatmeal easy to prepare, it also stores incredibly well, making it a fab make-ahead breakfast. 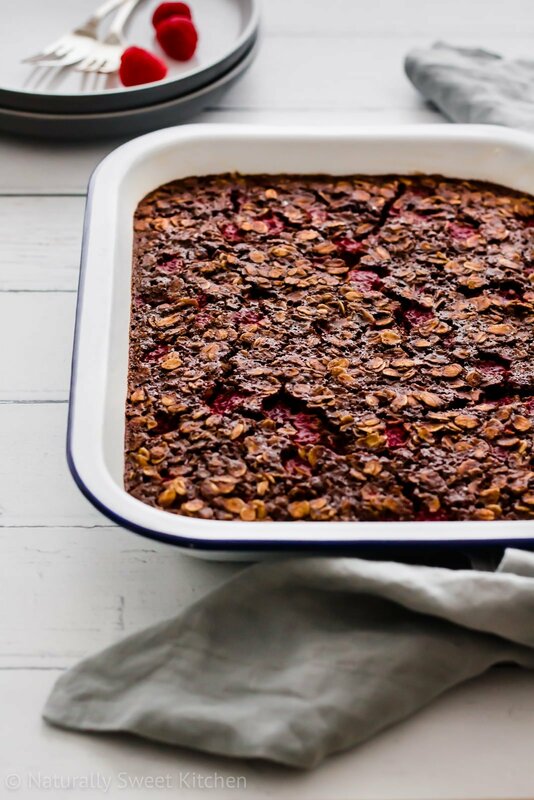 Prep this Chocolate Raspberry Baked Oatmeal on Sunday evening and reheat it for breakfast all week long! I also love it chilled straight from the fridge with a dollop of Greek yogurt. Make sure you use an airtight container and ensure that the baked oatmeal is completely cooled to room temperature before securing. Any residual heat can cause extra moisture, which will cause the oatmeal to go soggy and mould more quickly. Always store baked oatmeal in the fridge. Because it contains eggs, milk, and berries, it’s best to keep this baked oatmeal refrigerated. If you can’t eat the leftovers within four days, it’s best to freeze your baked oatmeal. For easy meals later on, slice your leftover oatmeal into portions and wrap separately in aluminum foil. Pack the individual squares in a sealable freezer container. Then when you need breakfast, all you have to do is remove a square from the freezer, pop into a preheated oven for 15-20 minutes. Instant, chocolatey breakfast. 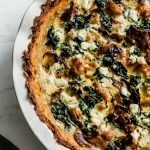 Looking for more crowd-pleasing brunch ideas? 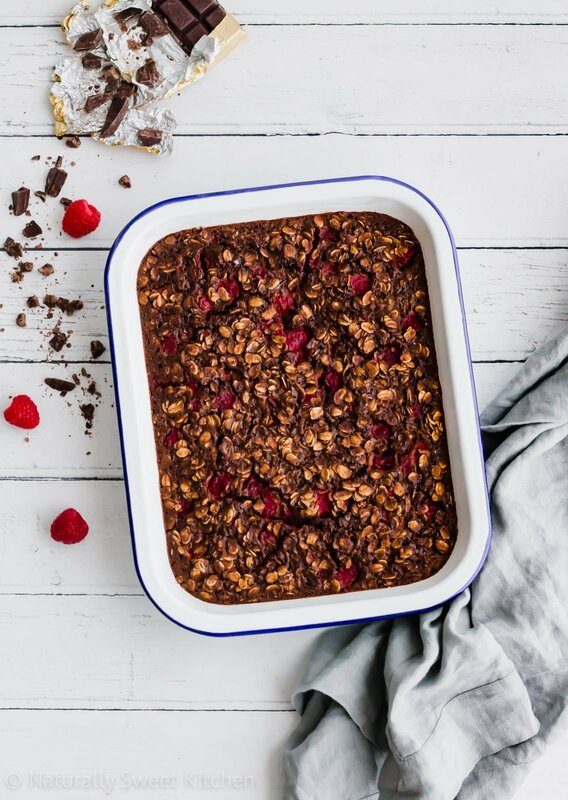 If you make this chocolate raspberry baked oatmeal, don’t forget to take a photo and tag me on Instagram – use the hashtag #naturallysweetkitchen so I can share your pictures! 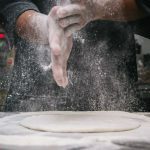 It makes my day to see these bakes come to life in your kitchen. 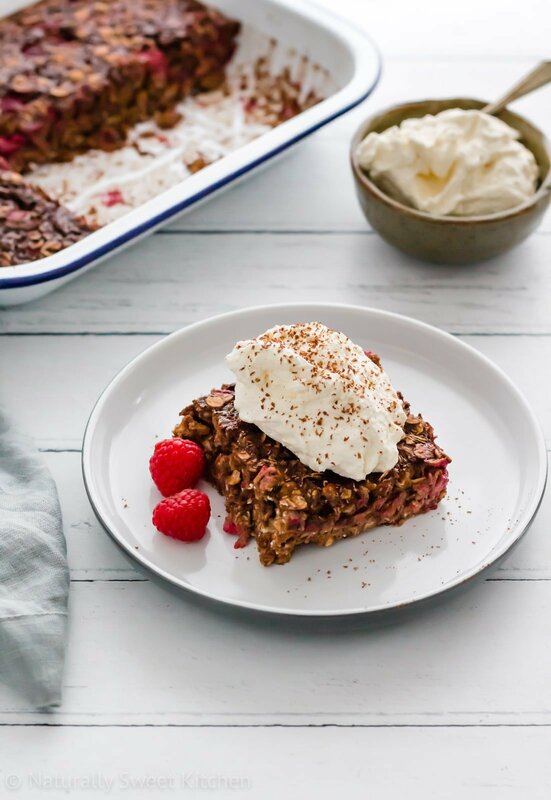 This decadent, sweet and tangy Chocolate Raspberry Baked Oatmeal is a great way to treat a crowd for weekend brunch. Preheat the oven to 180°C (350°F) and lightly grease an 11 x 9 inch (28 x 23 cm) baking tray with butter. In a large bowl, combine the oats, flour, baking powder, cacao powder, sea salt, and raspberries and mix well. Whisk together the milk, maple syrup, vanilla, and eggs in a separate bowl and then pour this mixture over the dry ingredients. Stir to coat the dry ingredients thoroughly with the wet ingredients. Tip the mixture into the prepared baking tray and smooth to the edges. Bake for 20-23 minutes, or until the top looks lightly browned and a toothpick comes out mostly clean. Allow the baked oatmeal to sit for 5-8 minutes before serving with a side of freshly whipped cream or yogurt and seasonal fruit. 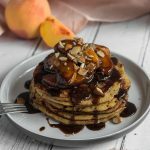 To make this recipe safely gluten-free, ensure you are using certified gluten-free rolled oats and use buckwheat flour in place of the spelt flour. This baked oatmeal will keep covered in the refrigerator for up to 4 days. Reheat before serving or enjoy cold.